The CEO of United Airlines has issued a stronger apology after a passenger was dragged from a United Express flight, calling the confrontation "truly horrific". Oscar Munoz said in a note to employees he continues to be disturbed by the events on Sunday night in Chicago. He said: "No one should ever be mistreated this way." Mr Munoz was widely criticised for two statements on Monday about the altercation in which he described the 69-year-old man taken off the plane as "disruptive and belligerent". On Tuesday, Mr Munoz said he was committed to "fix what's broken so this never happens again". He pledged to review the company's policies for seeking volunteers to give up their seats, for handling oversold flights and for partnering with airport authorities and local law enforcement. The company plans to share results of the review by April 30. Earlier, US President Donald Trump's spokesman said it was "troubling" to watch video of the passenger being dragged from the flight. But White House press secretary Sean Spicer said it was unlikely the federal government would launch a separate investigation. Mr Spicer said local authorities and United were reviewing the incident in which a man was forcibly removed at Chicago's O'Hare Airport. Video of the confrontation spread across social media. Mr Spicer said he was sure Mr Trump had seen the video but that any comment from the president could influence a potential outcome of the investigation. He added that he thinks everyone who has seen the video can agree that the situation could have been handled better. The passenger has been named as Kentucky physician David Dao. 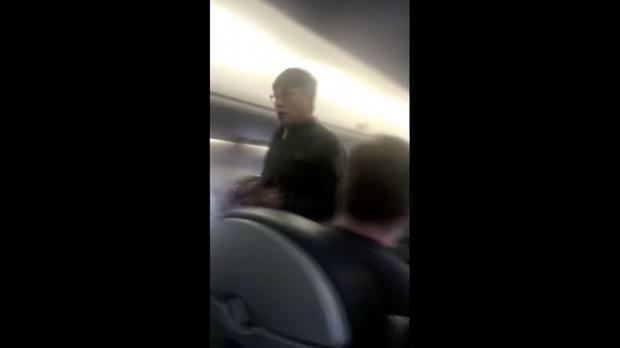 Video of police officers dragging the passenger from the overbooked flight sparked uproar. As the flight waited to depart, officers could be seen grabbing the man from a window seat, pulling him across the armrest and dragging him down the aisle by his arms. United was trying to make room for four employees of a partner airline on the Sunday evening flight from Chicago to Louisville, Kentucky. Other passengers on Flight 3411 are heard saying, "Please, my God," ''What are you doing?" ''This is wrong," ''Look at what you did to him" and "Busted his lip". Passenger Audra Bridges posted the video on Facebook, and it has been viewed hundreds of thousands of times, and triggered strong criticism of United. Her husband, Tyler Bridges, said United offered 400 dollar (£322) and then 800 dollar vouchers and a hotel stay for volunteers to give up their seats. When no-one volunteered, a United manager came on the plane and announced that passengers would be chosen at random. "We almost felt like we were being taken hostage," Tyler Bridges said. "We were stuck there. You can't do anything as a traveller. You're relying on the airline." When airline employees named four customers who had to leave the plane, three of them did so. The fourth person refused to move, and police were called, United spokesman Charlie Hobart said. "We followed the right procedures," Mr Hobart said. "That plane had to depart. We wanted to get our customers to their destinations." By Bharatha Mallawarachi and Krishan Francis, Associated Press Sri Lankan police say 207 people were killed and 450 wounded in a series of blasts in and around the country’s capital.